A Pakistani court today set September 5 as the deadline for President Asif Ali Zardari to disassociate himself from political activities and warned that he would have to face the consequences if he failed to do so. A three-judge bench headed by Chief Justice Umar Ata Bandial of the Lahore High Court asked the President to relinquish his post of chief of the ruling Pakistan Peoples Party. Piling up pressure on new Prime Minister Raja Pervez Ashraf, Pakistan Supreme Court today asked him to respond by July 12 to its order to reopen graft cases in Switzerland against President Asif Ali Zardari, an issue that had cost his predecessor his job. Britain's Queen Elizabeth shook the hand of former IRA guerrilla commander Martin McGuinness for the first time on Wednesday, drawing a line under a conflict that cost the lives of thousands of soldiers and civilians, including that of her cousin. The meeting with McGuinness, who is now the deputy first minister of Northern Ireland, comes 14 years after the Irish Republican Army ended its war against British rule in the province, and is one of the last big milestones in a peace process whose success has been studied around the world. A 26-year-old Indian employee at an IT firm, who was accused of murdering an American woman, was found dead after he allegedly committed suicide due to suspected drug overdose at a New Jersey hotel. 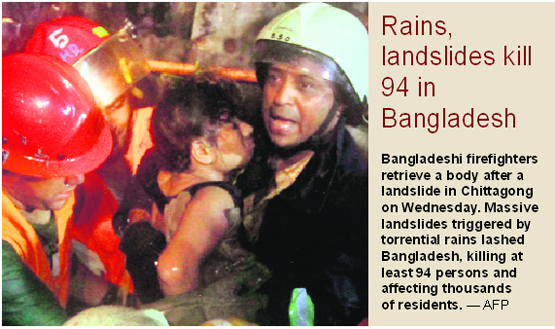 Pawan Kumar Anjaiah, 26, a software engineer, was in the US on an assignment with IT firm Cognizant. A short order issued by the bench in the evening said that if the President failed to act on the High Court's order of last year not to engage in political activities in the presidency by September 5, then the court might initiate contempt of court proceedings against him. Chief Justice Bandial said the issue had constitutional importance and the court's verdict was in accordance with the Constitution. He said the court has provided the President ample time to resign from his post of co-chairman of the PPP and to suspend all political activities in the presidency. Earlier in the day, the bench had said it would give another opportunity to the President to act on its order to dissociate himself from political activities. The bench made the observation in response to two petitions filed against Zardari for not quitting the political office of co-chairman of the PPP. The bench noted that the High Court had issued an order on May 12, 2011 that said it expected the President to disassociate himself from political activities as soon as possible. The court asked the petitioners whether the President had any immunity under Article 248 of the Constitution. A K Dogar, the counsel for one of the petitioners, claimed the President had no immunity in civil cases. Dogar said the court should summon Zardari to explain his position just as the Supreme Court had summoned former premier Yousuf Raza Gilani in a recent contempt of court case. Muhammad Azhar Siddique, the counsel for the other petitioner, argued that Zardari had not disassociated himself from political activities. A three-judge bench headed by Justice Nasir-ul-Mulk reminded Attorney General Irfan Qadir that former Premier Yousuf Raza Gilani had been convicted for contempt and sentenced for refusing to act on the apex court's orders to revive the corruption cases. The bench said in a brief order that it expected the new Premier would act on the court's directives. The judges asked the Attorney General to consult the Prime Minister and inform the court of his stance at the next hearing on July 12. Ashraf, a close aide of the ruling PPP chief Zardari, became Prime Minister after Gilani was disqualified by the apex court on June 19 following his conviction for contempt. Gilani had been convicted and given a symbolic sentence on April 26 after he refused to act on the apex court's repeated orders to approach Swiss authorities to reopen the corruption cases against Zardari. Gilani had contended that the government could not act as the President enjoyed immunity in Pakistan and abroad. Shortly after assuming office, Ashraf said on Sunday that the PPP had made it clear that it would not write a letter to Swiss authorities to reopen the cases against Zardari. He said there was no difference between him and Gilani on this issue. Ashraf had further said that his government did not want any confrontation with other state institutions and would work in accordance with the Constitution and the law. The Supreme Court has been pressuring the government to revive the cases against the President since December 2009, when it annulled an amnesty issued by former military ruler Pervez Musharraf that had benefited Zardari and over 8,000 others. Britain's Queen Elizabeth shook the hand of former IRA guerrilla commander Martin McGuinness for the first time on Wednesday, drawing a line under a conflict that cost the lives of thousands of soldiers and civilians, including that of her cousin. The meeting with McGuinness, who is now the deputy first minister of Northern Ireland, comes 14 years after the Irish Republican Army ended its war against British rule in the province, and is one of the last big milestones in a peace process whose success has been studied around the world. The queen met McGuinness, Northern Ireland's Unionist first minister Peter Robinson and Irish President Michael D. Higgins for just under 10 minutes behind closed doors in a theatre in a leafy suburb of Belfast cordoned off by hundreds of police. 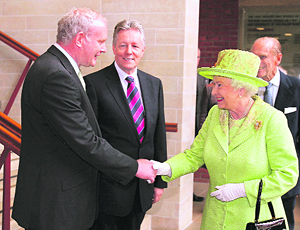 McGuinness shook the hand of the queen a second time as she left the theatre, this time in front of television cameras, but unlike other guests chose not to bow his head. The queen's bright green outfit appeared to have been chosen with Ireland's national colour in mind, and McGuinness wished a smiling monarch well in Irish, saying "Slan agus beannacht", which he told her means "Goodbye and god speed". There has been scattered opposition to the gesture of reconciliation from dissident Irish militants and from some of the IRA's victims. But the vast majority of the province's politicians backed the meeting, the first between the queen and a top member of the IRA or its former political wing, Sinn Fein. For the Queen and Prince Philip, the Northern Ireland conflict has a personal edge. The Queen's cousin, Lord Louis Mountbatten, the last Viceroy of India and also Philip's uncle, was killed by the IRA in 1979 when his boat was blown up in Ireland where he was on holiday. Three others, including Mountbatten’s 14-year-old grandson, were also killed. Delaware state police had issued arrest warrants against Anjaiah, charging him with first degree murder and possession of a deadly weapon, after a Pennsylvania woman Danielle Mehlman was found murdered in Delaware's Dewey Beach motel on June 18. However, the search for Anjaiah ended after authorities found him dead at a northern New Jersey motor lodge on June 19.